Here is something you can try that will make planing much easier. Some guys have done it already--this is for the rest of you. It costs nothing but a few minutes of your time and your back will love you for it, especially if you know that bending for long periods is very tiring. All you have to do is raise your planing board and form. How much depends on the height of your workbench and your own height, but it'll probably be from one to four inches. Begin with a block of wood under each end, 2" x 4", or whatever you can find, and try planing at this new height. When you see you are on to something good, and you will, then "fine tune" your board by finding your own optimum planing height. To do this, stand naturally with your forearm horizontal and note the height of your elbow. Your own optimum height for planing will be two inches lower. (This from an occupational therapist.) Remember though, this will not be the height of your board, but rather the height of the rounded portion of the plane'­s cap iron where you place your hand, so you have to make allowance for the plane and the thickness of your planing form. Of course, you don't have to be within fractions of an inch here--use pieces of standard dimensional lumber that give the closest result for blocks under the board. A properly adjusted board has other benefits. 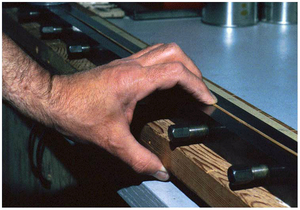 With space under the board you can use natureÃ­s gift of an opposable thumb to keep the strip from slipping as you plane. Place your finger tips on the strip in the form, your thumb under the board, and squeeze.